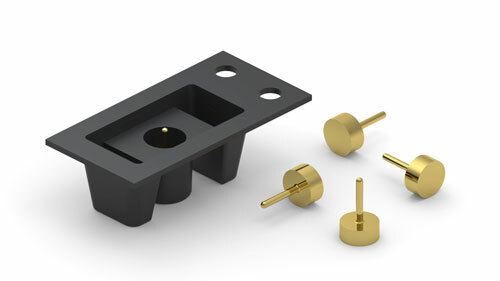 Mill-Max is pleased to introduce a new SMT pin for use as a test point or for low profile board-to-board connections. These pins are available packaged on tape & reel for pick-and-place assembly or in bulk for low volume requirements and prototyping. The part numbers are: 1508-0-57-15-00-00-03-0 for tape and reel packaging and 1508-0-00-15-00-00-03-0 for bulk. The 1508 pin features a large base for stability and for making a secure solder connection to the PCB. The tail/pin diameter is .018" (0,46 mm) making it suitable for plugging into a broad selection of standard Mill-Max receptacles or for attaching a test clip. The tape & reel packaged pins come 1,600 parts per 13" (330 mm) reel with a pitch of 8 mm and a tape width of 16 mm. The tape pocket has an opening of .110" (2,79 mm) allowing ample room for a pick & place vacuum nozzle to enter the pocket and draw the pin out. Tape and reel packaging is per EIA-481. The standard plating for the 1508 pins is gold, providing the highest interconnect reliability, corrosion protection and wear resistance. Tin and tin/lead plating options are also available upon request. The pins are made from brass alloy and like all Mill-Max pins are high-speed machined to precision tolerances.